Yōkai are a class of supernatural monsters, spirits, and demons in Japanese folklore. This book takes you into the world of Yokai in art, both two- and three-dimensional, and from vintage to contemporary worlds of art. If you’ve had the desire to travel to Japan to witness its fascinating supernatural art, Yokai Wonderland will let you do that without leaving your armchair. 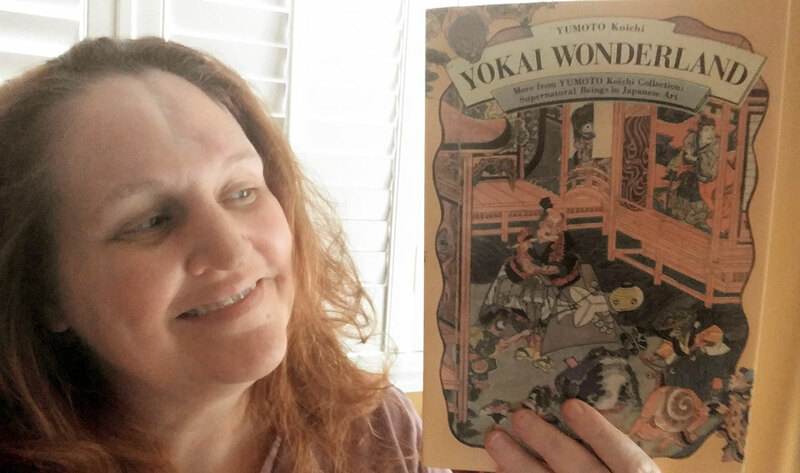 Filled with strangely familiar creatures, as well as those you may never have imagined, Yokai Wonderland is visually stimulating—and an interesting read, as well. The text is provided in both Japanese and English, and shares information—sometimes historical, sometimes contextual—about each piece of art shared within the pages. There are also a small collection of essays that delve deeper into various Yokai lore. The artwork in this book come from paintings, woodblock prints, scrolls, ceramics, kimonos, wooden sculptures, magazines, toys, board games, and more. This book is a sequel companion to Yokai Museum: The Art of Japanese Supernatural Beings from YUMOTO Koichi Collection, which was published in 2013. I really enjoyed leafing through the pages and looking at the art of the fantastic. Much of the art is from the Edo period (1603-1868), but there are more contemporary images, as well. The book is colorful and the imagery draws you in. But don’t leaf through this before bed! Some of the images might inspire a nightmare or two. The English translation of the Japanese text is very readable and provides interesting notes and historical context to the images. The book is printed on matte paper stock, which will probably make it last longer. But it does dull the colors. I wonder if at least some of the images would have been better served on glossy photographic stock. I would love to see at least a handful of pages on glossy photographic stock so that the colors of appropriate images would really pop. If you enjoyed the imagery of Hayao Miyazaki’s Spirited Away, you’ll enjoy Yokai Wonderland. It is a delightful romp through the supernatural imagination of Japanese culture.